IS BIGFOOT ABOUT TO BE REVEALED? It all began 2 weeks ago when an envelope arrived in my mail box with an Oregon-based postmark. This was one of a number of items in the box and I attached no particular significance to it. What a mistake that was. When I finally got around to opening the letter and reading it, I was, to say the least, startled by its contents. It came from a lady now in late middle age living in a particular town in the aforementioned state of Oregon and who worked as an events-organizer for a perfume company. She had recently read my book, Three Men Seeking Monsters and was looking for someone to speak with about "some photographs" that she had acquired after the recent death of her father that "will amaze you and that show a Bigfoot." She supplied a phone number and asked if I would call her, which I duly did. I am often contacted by people claiming this and claiming that and so I telephoned with no particular expectation of anything. And yet this call turned out not to be your average, everyday conversation at all. After we exchanged greetings, the woman informed me that her father had been a senior figure in US politics in Washington State in the 1950s and was also an avid hunter. To summarize the conversation (which lasted for 33 minutes in total): her father had been out hunting on his own on a sunday morning in the summer of 1952 in a certain area of dense forest land in northern Washington State. He had been hunting for several hours and was sitting on the floor in a clearing, drinking from a container of water when his attention was firmly captured by the shocking sight of a large, hair covered creature roaming through a thinly wooded area near to where the man was taking a rest from the day's activities. He continued to sit on the ground as the creature lumbered through the trees, pounding on several trunks as it did so. "Dad said it almost amused him, as if the animal was angry at something and was hitting the tree trunks in anger." She speculates that the creature's actions distracted its attention from her father because when only about 30 feet from him it suddenly stopped in its tracks and stared right at him with what seemed like a monumental look of surprise upon its face and its jaw dropped slightly but noticeably. The creature, her father stated, was immense: possibly eight feet in height, very muscular, with long, powerful arms and a wide head that sat on its shoulders atop a barely noticeable neck. The animal was covered in shiny black hair that seemed to cover all of its body apart from its face. And although the creature was human-like in shape, the man was of the opinion that it was more animal than human. It then backed away slowly from him, keeping him in view at all times before being lost in the trees. 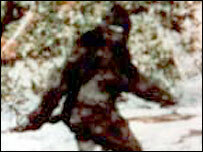 Of course, this would be just another Bigfoot story - except for one thing. The woman claims that she has in her possession a lengthy journal that her father kept at the time that describes the experience in a very detailed fashion and also 3 black and white photographs that her father took of the animal before it disappeared (and that he developed himself). "One is very clear and shows it just standing looking at him - he always had his camera. Dad said he never knew how he was able to not shake while he took the pictures, but he kind of did it, I think, without thinking; just grabbed his camera and took the pictures. If he had stopped to think, he probably wouldn't do it. The picture is very clear, you see all the body down to the knees and the head and eyes but with a lot of shadows for the rest." The two remaining pictures, she added, show the animal as it was in the process of backing away out of sight. Interestingly, she said that she has had a keen but private interest in Bigfoot for many years because of her father's encounter and she made a lot of comments about Bigfoot lore. Interestingly, she stated that she considers the so-called Patterson film footage of Bigfoot to be bogus for one key reason - "The animal my dad photographed has long, ape arms. It looks very like a very large animal and less like a man. But that film...the arms look human in length. That made me suspicious." Naturally, I asked for verification and confirmation of the story. So far I have received copies of photographs of her father taken during the course of his employment at official functions (including one with a well-known figure in 1950s US politics) and various official employment records that confirm his position. The photographs and the journal are frustratingly elusive and will remain so until we can schedule a personal meeting at the place and time of the woman's choosing. Right now, she has concerns about how this may ultimate play out and specifically with respect to her father's reputation, which is understandable. But things are afoot to arrange a meeting and I hope to report further in a future column (the woman is aware that this story has been posted to the Phenomena website and has expressed interest in seeing the feedback that develops). Of course, this could be nothing more than a hoax and the woman's claim of being in possession of Bigfoot photographs might be the equivalent of a claim to know the name of the second gunman on the Grassy Knoll, or the location of the "alien bodies" from the Roswell event. And yet I don't think so: there are the photographs already received of her father and - more importantly - one photograph of the woman taken with her father in 1993 and one taken with him in 1955 (3 years after his alleged Bigfoot experience). There is no doubt that these pictures show the same people and that the man is her father and that he did hold a senior position in 1950s Washington State politics. That is where we are at right now but this story may run and run. Back to Newspaper & Magazine Articles?